This example shows how to construct ensembles of classifiers in the Classification Learner app. Ensemble classifiers meld results from many weak learners into one high-quality ensemble predictor. Qualities depend on the choice of algorithm, but ensemble classifiers tend to be slow to fit because they often need many learners. In MATLAB®, load the fisheriris data set and define some variables from the data set to use for a classification. On the Apps tab, in the Machine Learning group, click Classification Learner. On the Classification Learner tab, in the File section, click New Session. In the New Session dialog box, observe that the app has selected response and predictor variables based on their data type. Petal and sepal length and width are predictors. Species is the response that you want to classify. For this example, do not change the selections. Classification Learner creates a scatter plot of the data. 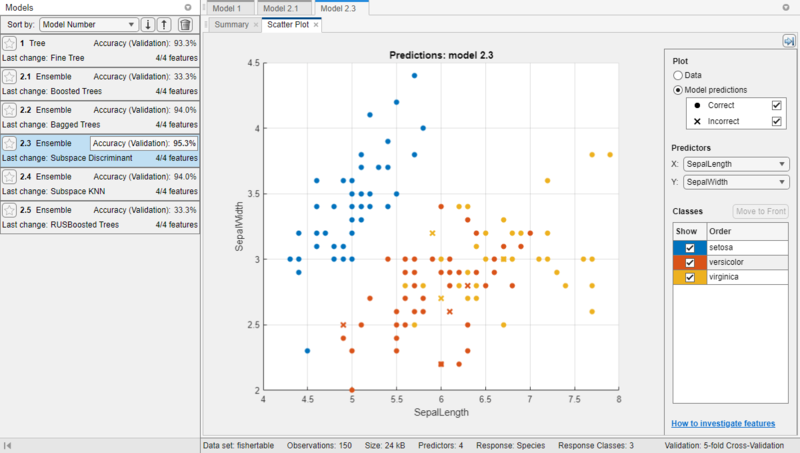 Use the scatter plot to investigate which variables are useful for predicting the response. Select different variables in the X- and Y-axis controls to visualize the distribution of species and measurements. Observe which variables separate the species colors most clearly. To create a selection of ensemble models, on the Classification Learner tab, in the Model Type section, click the down arrow to expand the list of classifiers, then under Ensemble Classifiers, click All Ensembles. In the Training section, click Train. If you have Parallel Computing Toolbox™ then the first time you click Train you see a dialog while the app opens a parallel pool of workers. After the pool opens, you can train multiple classifiers at once and continue working. Classification Learner trains one of each ensemble classification option in the gallery, and highlights the best score. The app outlines in a box the Accuracy score of the best model. Select a model in the History list to view the results. 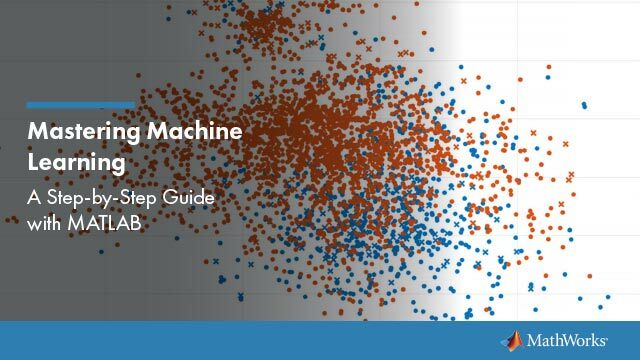 Examine the scatter plot for the trained model. Misclassified points are shown as an X. To inspect the accuracy of the predictions in each class, on the Classification Learner tab, in the Plots section, click Confusion Matrix. View the matrix of true class and predicted class results. Select the other models in the list to compare. Choose the best model in the History list (the best score is highlighted in the Accuracy box). To improve the model, try including different features in the model. See if you can improve the model by removing features with low predictive power. On the Classification Learner tab, in the Features section, click Feature Selection. In the Feature Selection dialog box, specify predictors to remove from the model, and click Train to train a new model using the new options. Compare results among the classifiers in the History list. To investigate features to include or exclude, use the scatter and parallel coordinates plots. On the Classification Learner tab, in the Plots section, select Parallel Coordinates Plot. Choose the best model in the History list. To try to improve the model further, try changing settings. On the Classification Learner tab, in the Model Type section, click Advanced. Try changing a setting, then train the new model by clicking Train. For information on the settings to try and the strengths of different ensemble model types, see Ensemble Classifiers. To export the trained model to the workspace, select the Classification Learner tab and click Export model. See Export Classification Model to Predict New Data. To examine the code for training this classifier, click Generate Function. Use the same workflow to evaluate and compare the other classifier types you can train in Classification Learner. Click the arrow on the far right of the Model Type section to expand the list of classifiers. Click All, then click Train. To learn about other classifier types, see Train Classification Models in Classification Learner App.